We have known for a long time of this documentary. 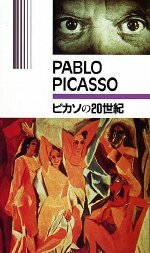 Frederic Rossif has focused his camera and his research on painters before, and in 1981, his film, Pablo Picasso, was released in the French cinema. Viewing it these days is a difficult feat. It has been broadcast on European television, and the copies that exchange hands between collectors have been from a Dutch TV broadcast. There was no known commercial release of this film. It is not available to purchase on videocassette or DVD. A real pity, since it contains a lot of unreleased Vangelis material, and represents that great era when Vangelis was in Nemo Studio in London. So it is not available. Does that stop Vangelis collectors from researching it? Of course not! Here as I type this, it is February 19, 2005. Just this past week, Seiya Hirano from Japan has been in touch with me about his latest research discovery. At one time in Japan, on a very limited basis, Pablo Picasso was indeed released on videocassette!!!! It seems to have been an academic release, as part of a series of videos called "The Wonder of Art", and may have only been available for purchase to universities. Regardless, it marks the first time that we have seen the release of this into the marketplace in any fashion. Finding this to buy might just be nearly impossible though. Hey, if collecting was easy, why would anybody bother?